i guess for the big time daily bloggers, the 250th post may not be a big deal, but for this here little ol' blog, it's taken more than a year to get here. so what to share for the big event? well, i ask you.. what can you get for 20 cents these days? not much my friend. but save up your 20 cent pieces & there's pure gold waiting for you. 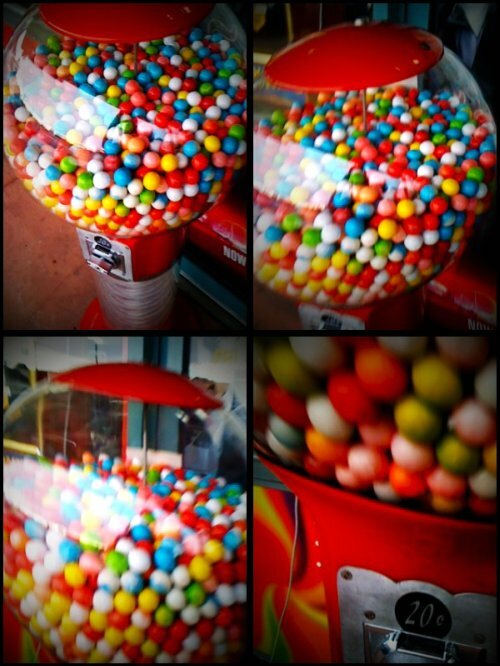 i knew when i spotted the gumball machine outside my local dvd store & it was only 20 cents (20 cents!) that i would be hitting it & hitting it hard. i knew it was going to be a 2 person job & the husband would just laugh at me if i asked him, so i waited my time until kingsley was in town. so this afternoon, i stood at the top & fed in my jar of twenties, while kingsley crouched at the bottom & collected the gumball gold. what treasure! I saw a dude and his mate eating ice creams the other day. He was eating a Bubble-O Bill, but was eating the bubblegum nose first! ha ha thats so cute! I needed a good laugh and this just gave me one! 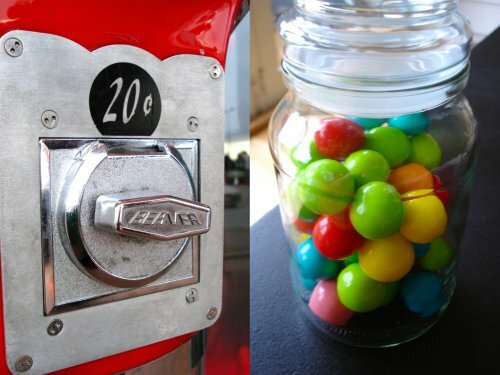 I love the fact you found gumballs for 20c. Childhood memories are flooding back! I would have been happy with one, but I think you are awesome for taking a whole jars worth home to celebrate! hey captain, happy 250th - pure gold every one of them!